Want to be notified of new releases in SF-WDI-LABS/mongoose-associations? Pull request Compare This branch is 11 commits ahead of sf-wdi-31:master. Real-world data usually consists of different types of things that are related to each other in some way. An invoicing app might need to track employees, customers, and accounts. A food ordering app needs to know about restaurants, menus, and its users! We've seen that when data is very simple, we can combine it all into one model. When data is more complex or more loosely related, we often create two or more related models. Understanding how to plan for, set up, and use related data will help us build more full-featured applications. Diagram one-to-one, one-to-many, and many-to-many data associations. Compare and contrast embedded & referenced data. Design nested server routes for associated resources. Build effective Mongoose queries for associated resources. Where should we be now? Use Mongoose to code Schemas and Models for single resources. 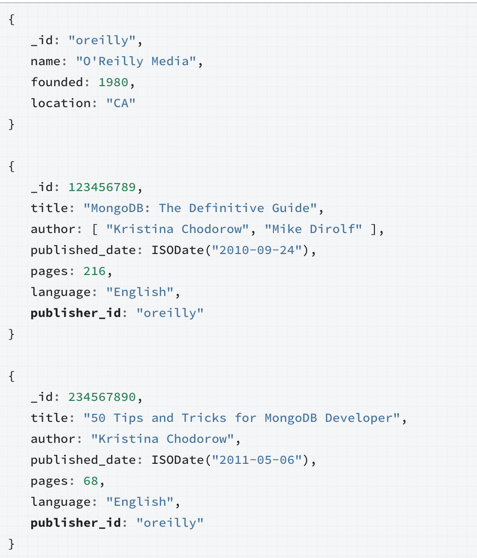 Create, Read, Update, and Delete data with Mongoose. Each person has one brain, and each (living human) brain belongs to one person. One-to-one relationships can sometimes just be modeled with simple attributes. A person and a brain are both complex enough that we might want to have their data in different models, with lots of different attributes on each. Each leaf "belongs to" the one tree it grew from, and each tree "has many" leaves. Each student "has many" classes they attend, and each class "has many" students. Entity relationship diagrams (ERDs) represent information about the numerical relationships between data, or entities. Note: In the example above, all of the Item1, Item2, Item3 under each heading are standing in for attributes. Come up with an example of related data. Draw the ERD for your relationship, including a few attributes for each model. Embedded Data is directly nested inside of other data. Each record has a copy of the data. It is often efficient to embed data because you don't have to make a separate request or a separate database query -- the first request or query gets you all the information you need. Referenced Data is stored as an id inside other data. The id can be used to look up the information. All records that reference the same data look up the same copy. It is usually easier to keep referenced records consistent because the data is only stored in one place and only needs to be updated in one place. While the question of one-to-one, one-to-many, or many-to-many is often determined by real-world characteristics of a relationship, the decision to embed or reference data is a design decision. There are tradeoffs, such as between efficiency and consistency, depending on which one you choose. When using Mongo and Mongoose, though, many-to-many relationships often involve referenced associations, while one-to-many often involve embedding data. How would you design the following? Draw an ERD for each set of related data? Can you draw an ERD for each? lets the food schema know that each food's ingredients attribute will hold an array. The object inside the  describes what kind of elements the array will hold. Giving type: Schema.Types.ObjectId tells the schema the ingredients array will hold ObjectIds. That's the type of that unique _id that Mongo automatically generates for us (something like 55e4ce4ae83df339ba2478c6). ref: Ingredient tells the schema we will only be putting ObjectIds of Ingredient documents inside the ingredients array. Once schemas are defined, we can compile them all into active models so we can start creating documents! Here's how we'd take our models for a spin and make two objects to test out creating an Ingredient document and a Food document. Note that we push the cheddar ingredient document into the cheesyQuiche ingredients array. We already told the Food Schema that we will only be storing ObjectIds, though, so cheddar gets converted to its unique _id when it's pushed in! Line 1: __v represents the number of times the document has been accessed. Line 2: The name property of the Food document we have created. Line 4: The unique _id created by Mongo for our Food document. Line 5: The ingredients array, with a single ObjectId that is associated with our Ingredient document. Mongoose is happy to show just the ObjectId associated with each ingredient in the food's ingredients array. When we need the Ingredient document data, we have to ask for it explicitly. When we want to get full information from an Ingredient document we have inside the Food document ingredients array, we use a method called .populate(). Line 1: We call a method to find only one Food document that matches the name: Quiche. Line 2: We ask the ingredients array within that Food document to fetch the actual Ingredient document instead of just its ObjectId. Line 3: When we use find without a callback, then populate, like here, we can put a callback inside an .exec() method call. Technically we have made a query with find, but only executed it when we call .exec(). Lines 4-15: If we have any errors, we will log them. Otherwise, we can display the entire Food document including the populated ingredients array. Line 9 demonstrates that we are able to access both data from the original Food document we found and the referenced Ingredient document we summoned. Click to see the output from the above findOne() method call with populate. Now, instead of seeing only the ObjectId that pointed us to the Ingredient document, we can see the entire Ingredient document. node console.js to enter into a REPL where you can interact with your DB. All the models will be nested inside an object called db. Create a food that references those ingredients. List all the ingredient data for a food. Many APIs don't populate all referenced information before sending a response. For instance, the Spotify API is riddled with ids that developers can use to make a second request if they want more of the information. On which of the following routes are you most likely to populate all the ingredients of a food you look up? Imagine you have a database of Users, each with many embedded Tweets. If you needed to update or delete a tweet, you would first need to find the correct user, then the tweet to update or delete. The tweets: [tweetSchema] line sets up the embedded data association. The  tells the schema to expect a collection, and tweetSchema (or Tweet.schema if you had a Tweet model defined already) tells the schema that the collection will hold embedded documents of type Tweet. Create tweets embedded in that user. List all tweets of a specific user. In routes, avoid nesting resources more than one level deep.